MichBusiness has teamed up with BASIC to offer our community member’s access to top-notch HR Compliance Solutions. With BASIC, stay compliant and up-to-date on changing policies, regulations, audits and more by entrusting us to proactively guide your business in the right direction, while you focus on what matters — growing and maintaining your organization! MichBusiness Trailblazers receive a 5% discount on ACA Elevate from service partner BASIC.. The Affordable Care Act (ACA) imposes demanding information reporting responsibilities on employers in the 2019 calendar year. The reporting stipulation states that an information return will be prepared for each applicable employee, and these returns must be filed with the IRS using a single transmittal form (Form 1094-B & 1095-B or Form 1094-C & 1095-C). For more information or to speak with a sales consultant call 800.444.1922 x 3 or visit basiconline.com. When you select BASIC through MichBusiness for your Payroll and Tax Filing operation, you save your company time, money, and paperwork. At the same time you enjoy personal service from your dedicated payroll specialist who is simply a phone call or email away. As a compliance company, BASIC understands overwhelming amount of mandatory notices and documents required for employers to remain compliant. Form 5500 Preparation is no different. 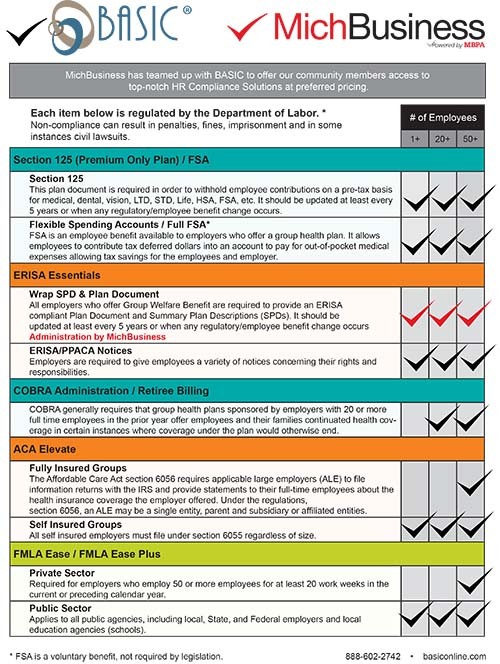 Required for employers with 100 or more participants in a Welfare Benefit Plan as defined by ERISA. With BASIC’s 5500 service, they will complete the welfare benefit plan 5500 filings for all Schedule “A”s, along with the required Summary Annual Report (SAR) preparation. MichBusiness members receive preferred pricing on all services and products offered by BASIC.